Well, look at me blogging twice in one week! This is practically unheard of these days! To be fair, I've just been really looking forward to sharing with you all by second pair of shiny shoes. Urgh, I'm sad. Quarter-life crisis or what. I just had to snap up these Vans-alike Topshop slip ons on the weekend. They remind me of my younger wanna-be-emo days (anyone else have a few pairs of these?!). I did order the pony skin-like pair online a few weeks ago, but found the fit extremely snug. Although my local store didn't have the pony ones in (wahh! ), they did have these shiny little beasties in the next size up. Hello twinkle toes. Having completely forgotten that owned this oversized bomber jacket, it was quite a treat coming across it on the weekend! 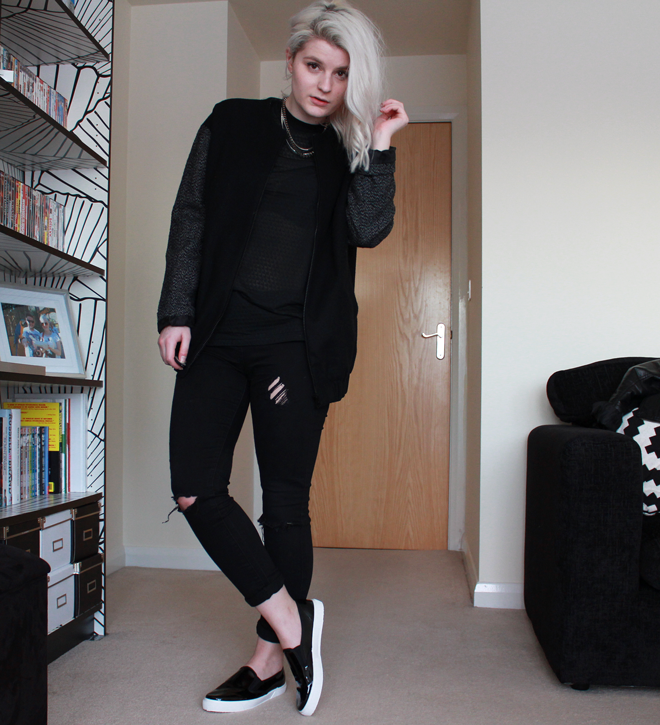 Comparing this to my last post is such a contrast - but I do like me some boyish clobber and an all black ensemble! I love this outfit, that jacket is lovely! I felt the exact same with the pony ones, they destroyed my feet! L O V E this! such a casj saturday outfit! Such a stunning outfit, I love the shoes! 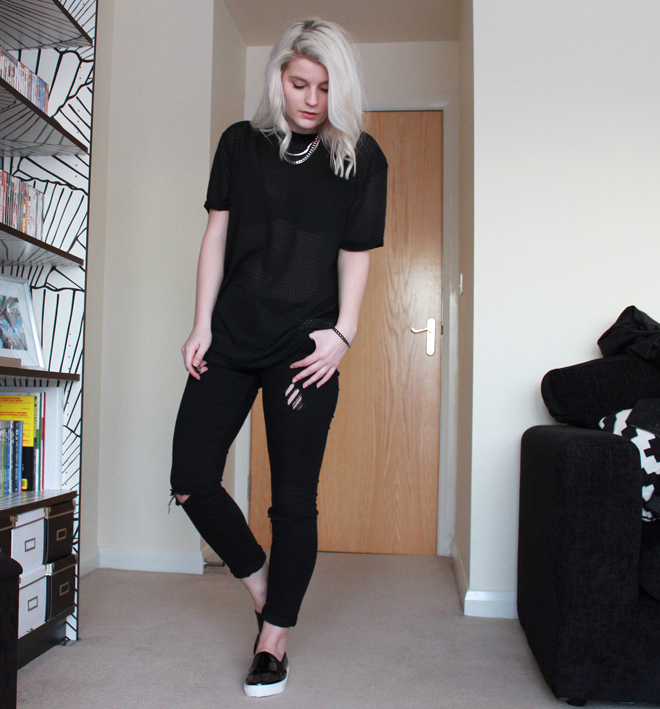 Love the all black look and the ripped jeans! I love your slip ons, I've been eyeing up some but not sure i'd pull them off! Looking very cool, love it. They're so shiny!! 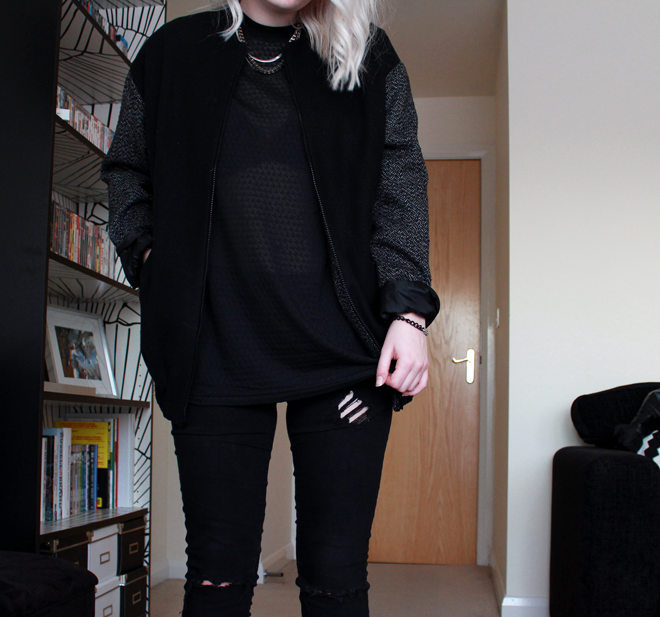 I've missed your regular outfit posts but this all black ensemble is cuuuute.